Many Chronic Kidney Disease nearing Dialysis and current Dialysis patients struggle to determine what they can safely eat. Some joke, "Sometimes I feel like all I can eat is cardboard - which isn't even a part of the Renal Diet." While the joke can fall flat, it highlights a real feeling in the Chronic Kidney Disease Community: The Renal Diet can be very limiting and nobody seems to care other than patients and loved ones. Well a little-known company, Vida-Fuel, was created with Chronic Kidney Disease patients in mind and has developed, approved and now launched Dialysis Tailored Snacks that are affordable (cheaper than a store-bought bag of chips) and tasty while still fitting within almost every patients' Renal and/or Diabetic diets (click here to learn more). 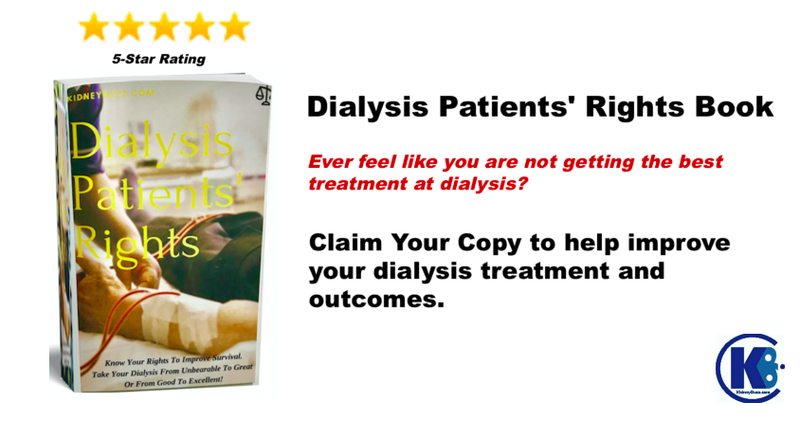 Many Chronic Kidney Disease nearing Dialysis and current Dialysis patients struggle to determine what they can safely eat. Some joke, "Sometimes I feel like all I can eat is cardboard - which isn't even a part of the Renal Diet." While the joke can fall flat, it highlights a real feeling in the Chronic Kidney Disease Community: The Renal (Kidney) Diet can be very limiting and nobody seems to care other than patients and loved ones. Well, a little-known company, Vida-Fuel, was created with Chronic Kidney Disease patients in mind and has developed, approved and now launched Dialysis Tailored Snacks that are affordable (cheaper than a store-bought bag of chips) and tasty while still fitting within almost every patients' Renal and/or Diabetic diets (click here to learn more). Patients who have tried the snack have suggested that it is "delicious!" Denise S. said that the BBQ Chips were, "I received a sample pack for the holidays from my clinic and went right online to order but everybody must like them because they're out of barbecue. I love them! Will be back to order soon. Thank you for creating something special." Ajene F. noted that, "I found the chips to be great...The flavor was not overpowering. They do fit within my dietary needs." The orders can be placed online or over the phone [615-430-8733] so it is very easy for patients to get their 'fix' of their favorite treat regularly (click here). Loved ones also find it very easy to order the snacks online and send them to their parents, siblings, friends, and neighbors as a one time surprise or as a monthly treat! The chocolate crisps have low phosphorus chocolate and low sugar for Diabetic patients - perfect for Valentines Day. 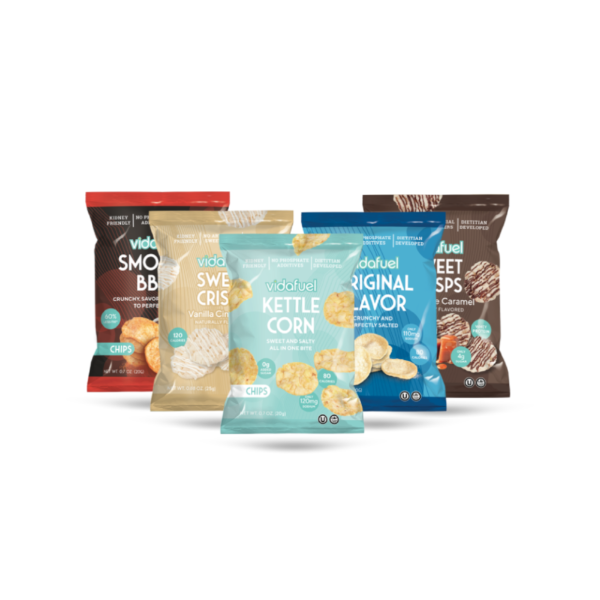 If you want to try the snacks, then get the sample pack which is limited and only costs $7.95 with FREE shipping (click here). If you are ready to try out your favorite flavor of chips or a sweet treat then use the exclusive PROMO CODE: KIDNEYBUZZ at checkout to save 15% on your order. The idea of a simple snack that is tailored for YOU - the Chronic Kidney Disease patient nearing Dialysis or the current Dialysis patient - may seem simple and obvious. However, patients know first hand that the Chronic Kidney Disease Community often does not receive the same attention as other major diseases. This is now changing. Beyond working diligently to draw awareness and support to ushering along promising breakthroughs like the Artificial Implantable Kidney, Artificial Wearable Kidney, 3D Printed Kidney Technology and more, as well as offer daily insightful news about how to live long with Chronic Kidney Disease and Dialysis, KidneyBuzz.com is committed to facilitating avenues that allow patients to feel included and not forgotten in order to further a higher and more fulfilling quality of life. Vida-Fuel joins us in the commitment and stands in your corner ready to serve you with great delights which you likely once thought were off limits. Enjoy and let us as well as Vida Fuel know if there are chips, snacks or other food favorites that you would like to see added to their offerings for yourself or your loved one(s). If you could have any food, drink or snack fit into your diet, that does not currently, what would it be? How do you fit some of your favorite foods into your diet and how is Vida Fuel going to help? Your insights could be very helpful to other patients so share your responses with the nearly 87,000 friends who have liked the KidneyBuzz.com Facebook Page (click here). Also, consider following the nearly 300,000 monthly visitors on KidneyBuzz.com for your Number One (1) source of Daily News, Information, Impact Meals, Inspirational Quotes, and tailored Products and Services which teach Chronic Kidney Disease, Dialysis, Kidney Transplant, Diabetes and High Blood Pressure patients how to better manage and improve their lives.